Chicago’s Premier Museum-Quality Gown Cleaning, Preservation, and Restoration Specialist! Your wedding gown is one of your most precious possessions. It is a symbol of an important event in your life and should be treated with special care. 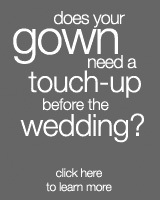 Whether you are borrowing it from a relative or buying it new, your gown deserves professional attention. The key to beautifully cleaning and preserving your gown is to begin the process as soon as possible. Stains will not have time to set and/or oxidize, which can make it much more difficult to achieve complete stain removal. As proud members of the Association of Wedding Gown Specialists, we are licensed to use the safest, most effective methods developed for preservation and restoration of all heirloom fabrics. A blind test of four nationally known gown preservation services conducted by the National Bridal Service proved our MuseumCare™ preservation is the cleanest, provides the safest packaging environment, and offers the most comprehensive guarantee. Evaluation and Inspection: All gowns are thoroughly inspected, and a written evaluation is completed and discussed with each client. Notes are made regarding fabrication, existing damage, and stain identification. Proposed remedies and potential results are detailed. Wedding Gowns Are Processed On Our Premises: Many dry cleaners accept wedding gowns for cleaning, restoration and preservation but perhaps because of lack of technical skills and/or experience do not do the work themselves. Unfortunately your gown is sent off site and the company you entrusted with your gown is in fact not the company that performs the work! Hand Finishing: Your gown is gently and completely hand ironed to perfection. This is the phase of the procedure where extreme care must be taken to follow the designer’s line and drape. Their creative designs as well as their unique and beautiful laces, embroideries, appliques, pearls, beads, and sequins demand a degree of hand finishing that only truly dedicated artisans have the skill and knowledge to provide. At Davis Imperial Cleaners, we treat each gown with the same care we would lavish on our own family heirlooms. Post Inspection: You may arrange to inspect your wedding gown before preservation is completed. Should you desire to view the preservation of your gown, we will proudly accommodate your request. MuseumCare™ Preservations’ Environmentally Pure, Lasting Protection: Vacuum or plastic seals and other acidic materials damage gowns. Your finished gown is placed in a 100% acid-free archival-quality wedding chest. Our preservation specialist will wrap your gown in pre-washed bleached muslin beautifully detailed in lace and satin roses and personalized with your monogram. Our archival-quality 100% acid-free tissue paper is then placed in all the folds of your gown to buffer any potential wrinkles. Your Wedding Gown Specialist box is then closed and then gently slipped into a Treasured Memories muslin sleeve. Attached to every preservation are 100% white cotton gloves. After our brides put on their gloves, they are able to touch and see their gowns whenever they desire without damaging their dress. In fact, we advise our clients to open their wedding chest every year and let air circulate around their gown. This is of particular importance because natural fibers need to breathe. Cleaning and Preservations: Accomplished in 8 to 12 weeks. Restorations are generally completed from 10 to 14 weeks. Pricing: Museum-quality cleaning and preservations begin at $585. Prices are based on the silhouette, condition of the gown, fabrication, trims and embellishments, and the labor necessary to restore it to a like-new condition. All charges for cleaning, restoration, and/or preservation are prepaid. For your convenience, we accept a check, Visa, MasterCard, or American Express. Lynda and Rick Wood are the proud owners of Davis Imperial Cleaners, Chicago’s only licensed, certified preservation and restoration specialist. Their accomplishments in fabricare are recognized with the Award of Excellence, beginning in 2006, by the Clothing Care Council in Washington, DC. As an invited member of Leading Cleaners Internationale, they are a recognized as one of the Top Ten Five Star Certified Couture Cleaners™ in the world. Davis Imperial Cleaners is endorsed by the Association of Bridal Consultants and the National Bridal Service. Chicago Social, Chicago Social Brides, Martha Stewart Living, WeddingChannel.com, Elegant Bride, Modern Bride, TheKnot.com, Brides.com, and Bride-Buzz.com have all showcased their organization. As “A Perfect Ten,” “The Go-To Spot for Chicago Brides” (CS Brides Magazine) and “The Go-To Destination for Cleaning and Preserving a Designer Gown” (Bride-buzz.com), Davis Imperial Cleaners is proud to be referred by the most exclusive bridal salons, premier retail stores, specialty boutiques, event planners, five-star hotels, and couture designers. References furnished upon request. To arrange for a free personal consultation or pick-up and delivery service, call us toll free @ 866.267.4560 or email us at info@davisimperial.com.